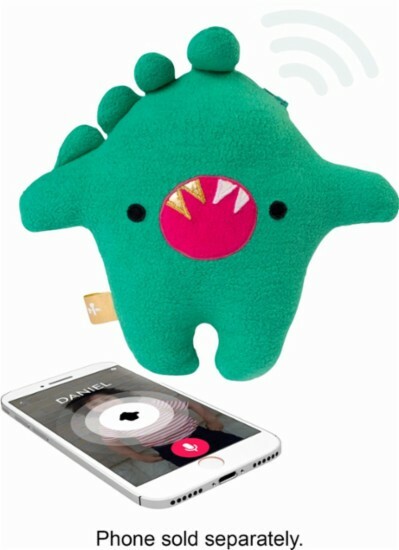 There have been ads on the radio recently for a wifi enabled toy called Talkies, which are advertised as being able to communicate with app enabled phones, with a "trusted circle" that other phones can be added to. Be very, very careful. It's not KRACK that is the problem, it is a lax attitude to security and privacy in general. So called "smart" consumer products can often be hijacked, accessed from the internet, or monitored. As a customer, it is hard to know if any specific product is safe or not. Furthermore, the terms are generally vague about data retention, and reserve the right to terminate the service at any time without sufficient reason. Additionally, two of the toys transfer personal information to a commercial third party, who reserves the right to use this information for practically any purpose, unrelated to the functionality of toys themselves. [I]t was discovered that two of the toys have practically no embedded security. This means that anyone may gain access to the microphone and speakers within the toys, without requiring physical access to the products. This is a serious security flaw, which should never have been present in the toys in the first place. [T]wo of the devices have flaws which could allow a potential attacker to take control of the apps, thus gaining access to children’s real-time and historical location and personal details, as well as even enabling them to contact the children directly, all without the parents’ knowledge. Smart toys and entertainment devices for children are increasingly incorporating technologies that learn and tailor their behaviours based on user interactions. These features could put the privacy and safety of children at risk due to the large amount of personal information that may be unwittingly disclosed. So unless you have a real need (other than "this is cool") for these kinds of products, I would say that your best approach is to simply stay away from them. It really depends on your threat model. I wouldn't be particularly worried about a particular sexual predator in your local area having the technical skills necessary to utilize Krack to inject voice into the toy. Unless it uses the vulnerable Linux driver, the key clearing won't work and the partial nature of the compromise for a general reset would make voice injection nearly impossible. Similarly, as a client device, it doesn't offer a whole lot of security risk other than possibly as a listening device, depending on if it is always on or activated by pushing a button. Krack wouldn't make it usable as an entry point in to your network directly, so I don't see it as a particularly riskier device than any other IOT device. As always in security, it comes down to your risk aversion though. Personally, if I thought it would be valuable to my child (who is also 3) I don't think I would consider the local security implications as a reason not to get it for my home environment. I'd be more concerned about the controls and security on the web side. My main concern for IOT devices isn't the local compromise so much as the web connected remote compromise. The chances of a sufficiently skilled and motivated malicious individual in your direct proximity is pretty low. The chances of a motivated and malicious user on the Internet trying to remotely access the IOT device is significantly higher and it's important to understand what holes the devices punch in your network protections. Also, as Michael was kind enough to point out, the interests of such a broad hacker are much less likely to be concerned with your privacy and much more likely to either be interested in attacks on your other computers or on the computational capabilities of the device as an attack bot. Mirai is a type of malware that automatically finds Internet of Things devices to infect and conscripts them into a botnet—a group of computing devices that can be centrally controlled. One reason Mirai is so difficult to contain is that it lurks on devices, and generally doesn't noticeably affect their performance. There's no reason the average user would ever think that their webcam—or more likely, a small business's—is potentially part of an active botnet. And even if it were, there's not much they could do about it, having no direct way to interface with the infected product. The problem is that security is seldom a consideration when making toys like this. The technology to make all this work is fairly simple, but the companies aren't paid to think about this. It's a child's toy. It's meant to be cheap and easy. And you get what you pay for. I'm going to be honest. These things are scary powerful in what they can do. Even if it doesn't expose your messaging, it could still be used for something malicious like a DDOS attack. If I were you, I'd pass on anything like this unless there's something explicit about security. This is pretty much the same kind of toy as CloudPets. Those were toys that allowed talking with the children (toy) by using a mobile app. The security was terrible. It turned out that both the user details and the pet recordings were available on databases with no password. And the company didn't even answer to the mails alerting them of the vulnerabilities. Now, Talkies may actually have made the right choices (it's hard to do so many things wrong as CloudPets did! ), but this showcases the level of security of this sector. So no, I wouldn't trust this toy with my kids data. Not to mention how the toy itself could be compromised (eg. like Hello Barbie). Internet-enabled anything poses a risk. As a rule, security is an expense and consumers as a whole really don't consider product security when making purchasing decisions. For example, there was a thread on Reddit recently about a couple who got divorced and she didn't change the password on the Nest thermostat. So while she was out, he would crank up the air conditioning or heat and cause massive utility bills. We also know of baby monitors that have been used to listen in on neighbors without their consent. I've attended IT security demos of internet-connected light switches, showing how easy it was to attack them. krack is important, definitely, but when compared to a non-existent security posture is irrelevant. Quite simply, if someone is concerned about security, I'd suggest not purchasing networkable anything unless they can identify a need for it to have a network connection and they have the skills to properly secure both it and their network. Encourage creativity. Build skills. Get the kid a bunch of building blocks or a train. Get a Spirograph. Play cards/games with them. Find something that they will play with for hours that doesn't require your constant attention. This puts the "IOT" in "IDIOT!". Most of the companies that make these have no clue how to prevent hackers from taking them over, sometimes programming comically stupid/obvious exploits into them. The KRACK exploit might be irrelevant half the time since most of these manufacturers wouldn't figure out how to implement some form of encryption. Any type of internet-enabled voice recording is potentially creepy and downright dangerous invasion of privacy. These devices likely use the cloud for sound processing and storage considering they are almost certainly based on low-grade ARM chips and minimal cheap flash storage at most. Even if the device is properly made, there's no similar guarantee on the cloud app it uses. You'd be surprised how often researchers happen to stumble on valuable leftover data in the cloud that the previous user of a logical machine instance failed to clean up. Not the answer you're looking for? Browse other questions tagged wireless iot or ask your own question. how to monitor a Wifi (802.11) network? Can wireless (wifi, blutooth..) be attacked even when not connected? How to prevent my MI AIR purifier from listening on my wifi traffic? How to prevent WiFi jammer attack? How to secure Nikon Cameras open WIFI?